I also chatted with Corey and Diane Rusk, of Magnolia. They were running errands in the area and decided to stop by for breakfast, taking the time to enjoy their burritos at another patio table behind me. They really liked the salsas, they said as they were leaving. 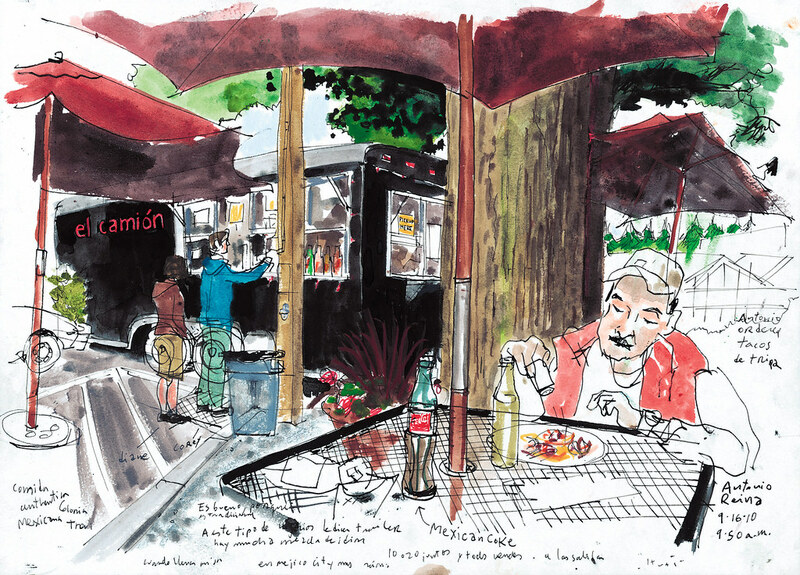 This “el camión” opened in January 2008, more than a year before Marination and Maximus/Minimus joined Seattle’s curb cuisine scene. Owner Scott McGinnis has opened two more since then, one in SODO and another one in Ballard. “I used to live in LA and got accustomed to good authentic Mexican food … I felt that Seattle needed something like that,” said McGinnis. He also lived part-time in Mexico years ago and fell in love with the Mexican culture. “They invite you to their house and before you know it you are having a great meal and falling in love with it,” he said. It is that sense of community that I’ve enjoyed the most these days ordering food from mobile kitchens around the city. People from all walks of life are coming to these trucks, hanging out together and having great food. Lunchtime can’t get much better than that.